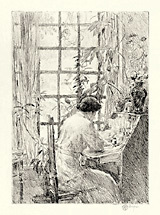 The Writing Desk- - 1915, Etching. Cortissoz and Clayton 56. Edition unknown, small. Signed with the artist’s monogram, in pencil. Signed and dated in the plate, upper right. Image size 10 x 7 inches (254 x 179 mm); sheet size 12 1/2 x 9 1/2 inches (318 x 241 mm). 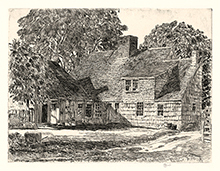 A fine impression, on cream wove paper, with full margins (1 1/8 to 1 1/2 inches). The artist’s tack holes at the four sheet corners; a short (1/2 inch) repaired tear in the top right sheet edge; otherwise in excellent condition. Printed by the artist. 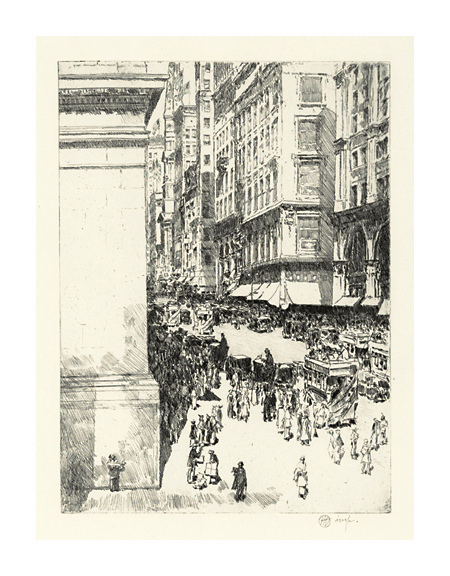 Fifth Avenue, Noon- - 1916, Etching. Cortissoz 77. Edition c. 20, 2nd state of two. Signed with the artist's monogram in pencil. Signed and dated in the plate, lower right. Image size 9 15/16 x 7 3/16 inches (252 x 183 mm); sheet size 12 5/8 x 9 3/4 inches (321 x 248 mm). A fine, crisp impression, on cream wove paper, with full margins (1 3/8 inches); the artist's tack holes at the sheet edges, in excellent condition. Printed by the artist. 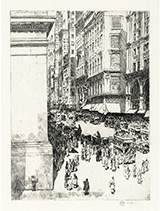 A view of Fifth Avenue looking north from 34th Street, etched from life. Collections: Achenbach Foundation for Graphic Arts, Cleveland Museum of Art, Corcoran Museum of Art, Metropolitan Museum of Art. Exhibited: Museum of Fine Arts Boston, 1922; Carnegie Institute, Pittsburgh, 1916, 1922. Cover illustration for 94 Prints by Childe Hassam, Joseph Czestochowski, 1980. 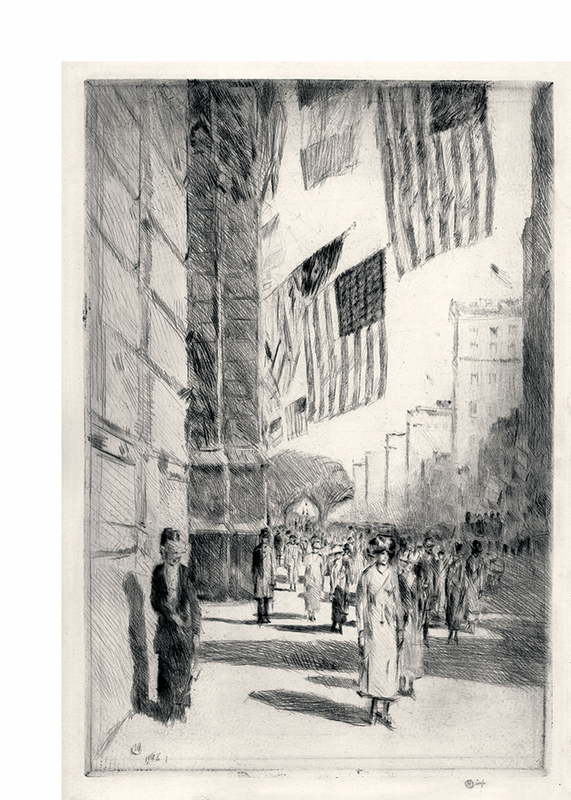 Avenue of the Allies- - 1918, Drypoint. Clayton/Cortissoz 147. Edition unknown but very small, only state. Signed with the initials cipher in pencil. Signed and dated in the plate lower right. Image size 14 3/4 x 9 3/4 inches (375 x 248 mm); sheet size 17 1/8 x 11 1/4 inches (435 x 286 mm). A fine impression, in warm black ink, on antique cream laid paper, with full margins (1 3/8 to 1 7/8 inches); the sheet a page torn from an old book, with a geometric engraving verso, the sheet edges consequently ragged in places with a tear in the upper right just into the platemark. Printed by the artist. Extremely scarce. A New York City view of Fifth Avenue looking towards 59th Street, with the trees of Central Park visible in the background. 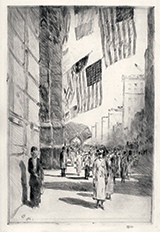 After World War I Fifth Avenue was renamed The Avenue of the Allies during the Liberty Loan drives of 1918. 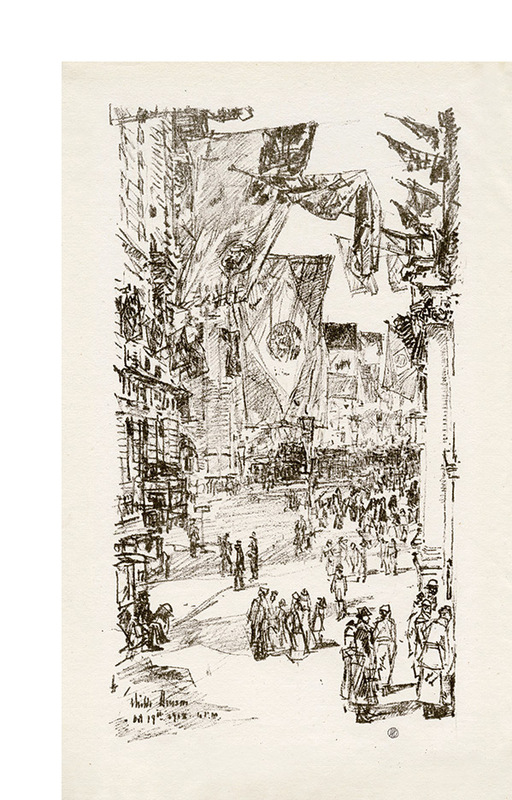 Hassam made a number of famed paintings of this subject (known as the Flag Series), but just a few etchings, starting in 1916. 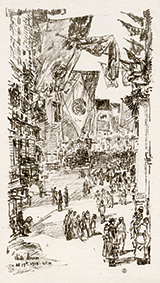 Avenue of the Allies- - 1918, Lithograph. Kleeman 2, Griffith 43. Edition 117. Signed with the initials cipher in pencil, in the bottom right margin. 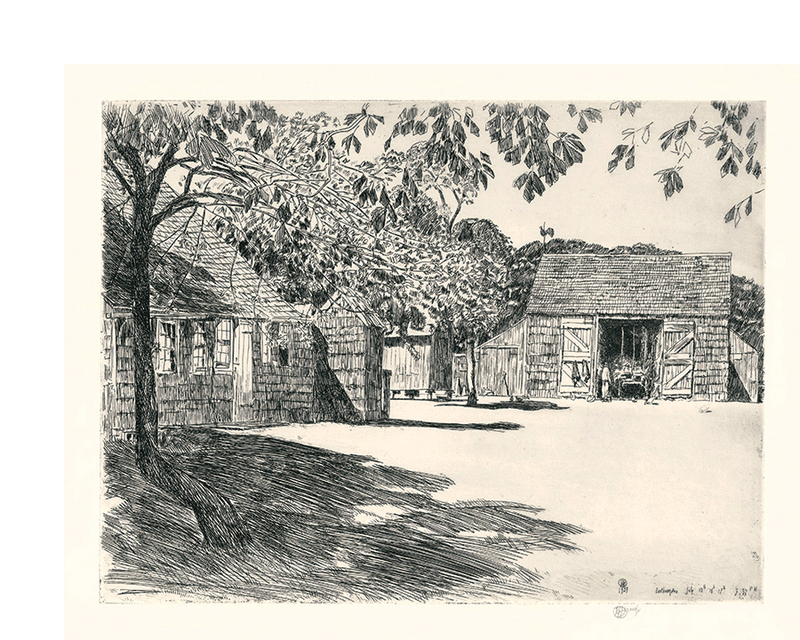 Signed, dated, and inscribed Childe Hassam / Oct 19th, 1918 4 p.m. in the stone,lower left. Image size 12 1/2 x 6 7/8 inches (317 x 175 mm); sheet size 15 x 11 1/2 inches (381 x 292 mm). A fine impression, in warm black ink, on antique cream laid paper, with full margins (1 to 2 1/2 inches), in excellent condition. Printed on a full leaf book page, with binding holes and torn edge on the right sheet edge, and light-toned deckle edges on the other three sides. Printed by the artist. A view of New York City's Fifth Avenue. 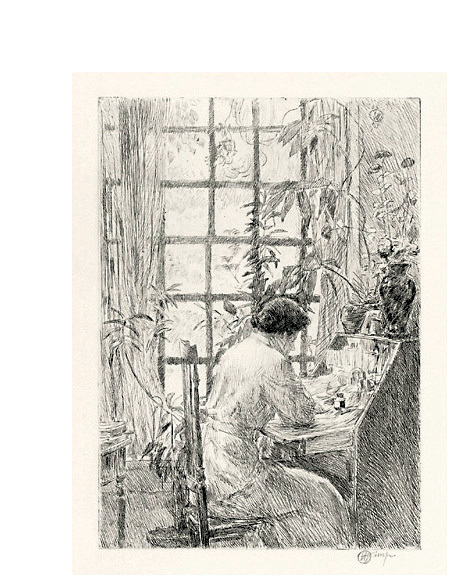 Reproduced: 94 Prints by Childe Hassam, edited by Joseph S. Czestochowski, Dover, 1980. 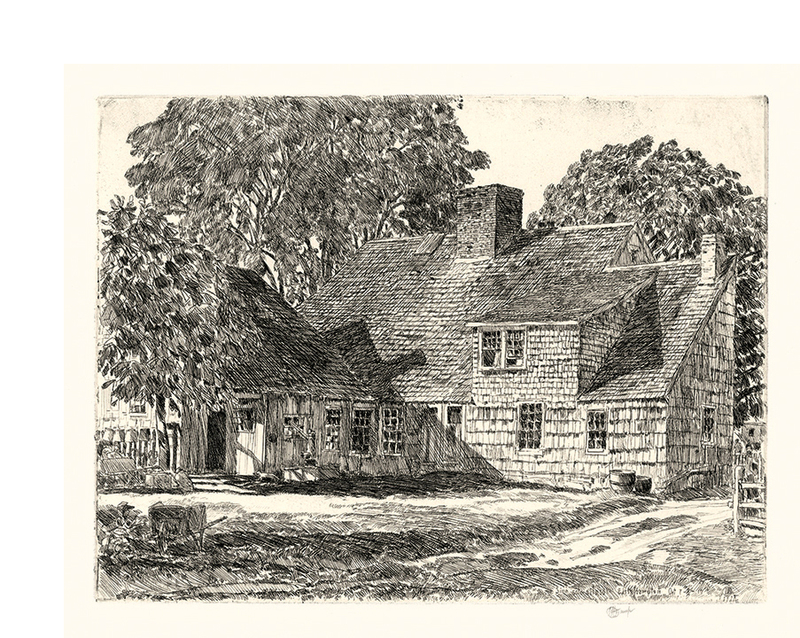 The Old Dominy House (East Hampton)- 1928, Etching. Cortissoz 303. Edition not stated. Signed with the artist's monogram in pencil. Signed, dated, and annotated Easthampton in the plate, lower right. Image size 9 x 12 inches (229 x 305 mm); sheet size 12 x 15 inches (305 x 381 mm). Collections: Metropolitan Museum of Art, Amica Library, Albright-Knox Art Gallery, Pennsylvania Academy of the Fine Arts, Cornell University Library, Yale University Art Gallery, Brooks Memorial Art Gallery, Smithsonian American Art Museum. 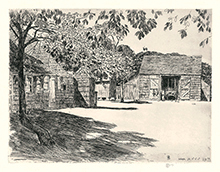 The Old Mulford Farm (East Hampton)- 1929, Etching. Cortissoz 319. Edition not stated. Signed with the artist's monogram in pencil. Signed, dated, and annotated Easthampton in the plate, lower right. Image size 8 15/16 x 12 inches (227 x 305 mm); sheet size 12 x 15 inches (305 x 381 mm). Reproduced: Impressionist Prints of Childe Hassam, edited by Joseph S. Czestochowski, Dover, 2003. Collection: Yale University Art Gallery.